No. You can’t. Which is ironic given the name of the race. But I digress. Let me start at the beginning. My husband is running the Track Shack Running Series and this is one of the races in the series. Last week he asked me if I wanted to run this race again (we also ran it back on 10/10/10). After looking over my half marathon training schedule to see if the race would be a good fit and then checking with my trusty training partner Beth, I signed up for the race. And because I am alumni, I saved a couple of bucks on my registration. Score! All three of us are UCF alumni, so it’s always fun to take a jaunt back on campus. Sunday morning, D, Beth and I set off for the main campus. There were jokes to be made about trying to find an actual current student that was awake since it was eerily quiet near the dorms. Beth and I did, however, run into running friends and took the opportunity to catch up. 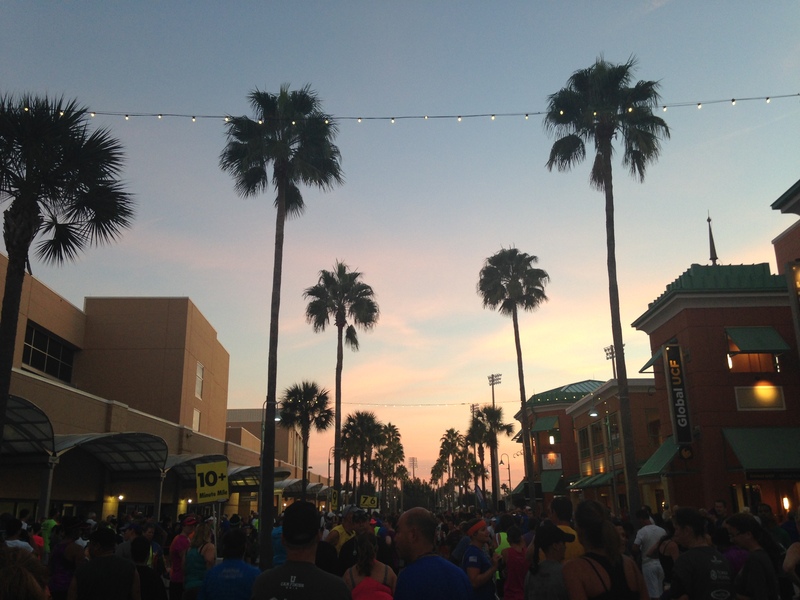 Also, the sunrise was a gorgeous backdrop to the start of the race. I’m a sucker for sunrises. And did I mention the weather was perfect? Because it was. It was in the 60’s and cool, perfect for a run around our old campus. The race started on time (or at least I didn’t notice it starting late) and Beth and I set off running mile intervals (run one mile, walk one minute, repeat). 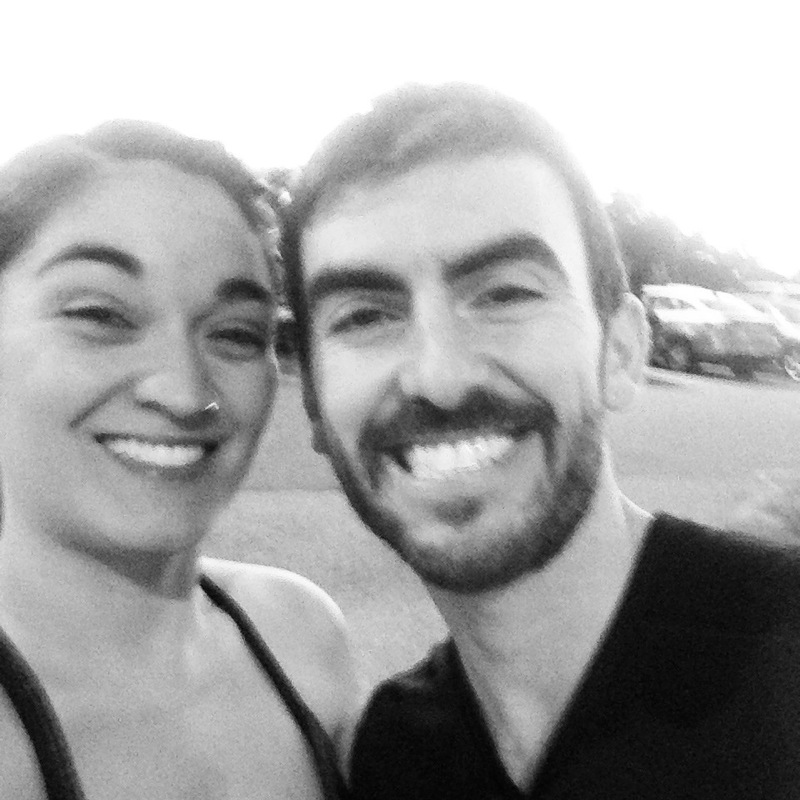 We were busy reminiscing about our college years as we ran the first couple of miles. However, when we passed the three-mile marker, I noticed that my Garmin didn’t match up. And then when we passed the four-mile marker, Beth pointed out that the last mile seemed to go by too fast. Sure enough, when I checked my Garmin, I had a shorter distance. We also started to notice that the course was getting confusing. There were cones lining a route, but runners going in a different direction. We noted that having volunteers there would probably help with the confusion. In fact, volunteers on the course seemed to be scarce. We later heard from our friends that they ran the wrong direction and had to turn around. Even with that error, they still didn’t hit five miles. Also, I also couldn’t help but feel like the race course wasn’t quite taking advantage of the sprawling UCF campus. There were a couple times that we ran down one street just to double back. I’m not a big fan of doubling back unless I’ve lost something. As we neared the finish line, I knew something was wrong. We weren’t supposed to finish yet! 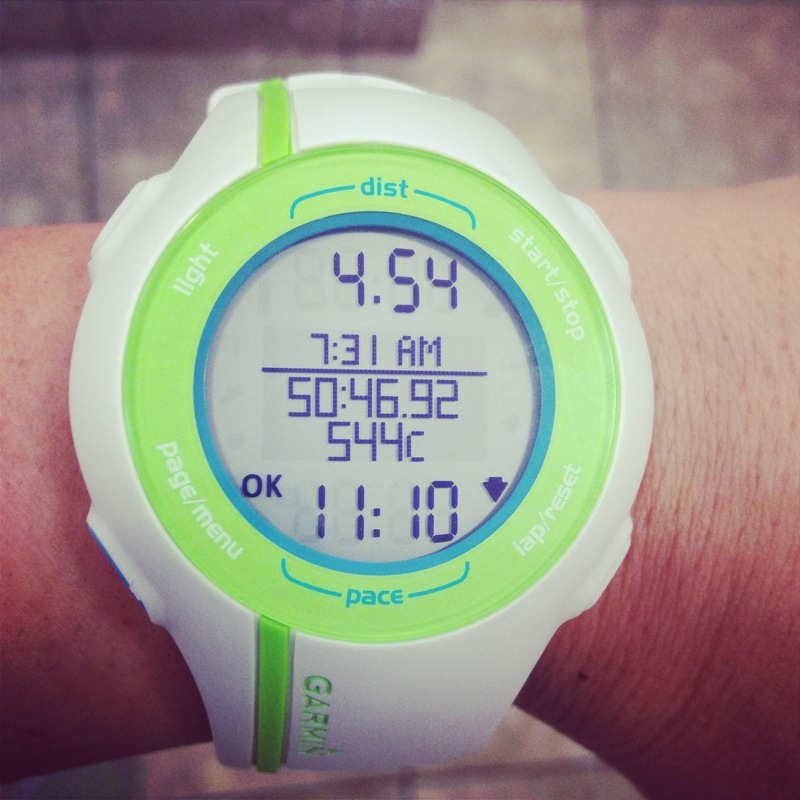 And sure enough, when we passed the finish line my Garmin showed our distance completed to be 4.54 miles. Enter all of the “you can’t finish” jokes you can think of. Oh, the irony! Did you run the U Can Finish 5-miler this year? What did you think? Two days ago a person almost killed me and my friend Rachelle. This was a person that I trusted to do what was right. I learned a valuable lesson. Never trust people. Let me start from the beginning. It all started around 6am. My friend and I were a couple of miles into our four-mile run when we approached a four-way stop. As always, we slowed down to see if there were any cars approaching. We saw the car coming, but it was still slowing down for the full stop. Since the car wasn’t full braked yet and would still have to stop at the stop sign, as you should always do at a stop sign, we thought we had time to cross. Also, by this time we were in the driver’s headlights so surely they could see us, right? There was no way I was going to cross in front of her car. I didn’t trust her. So we went into a stand-off until she finally drove away and I crossed the street. Tuesday morning I learned my lesson as a runner: Never trust people. Unless they are handing out free pretzels during a marathon. Then, by golly, take all the free pretzels you can get your hands on. Have you ever been almost hit by a car while running? I ran through another spider web this morning. I’m not sure why spiders keep spinning webs across streets and how it is that I keep hitting them first out of the group, but I don’t like it one bit. Thanks to my girls, who attempted to de-web me while laughing their heads off. I rarely purchase race photos because of their ridiculously high prices. 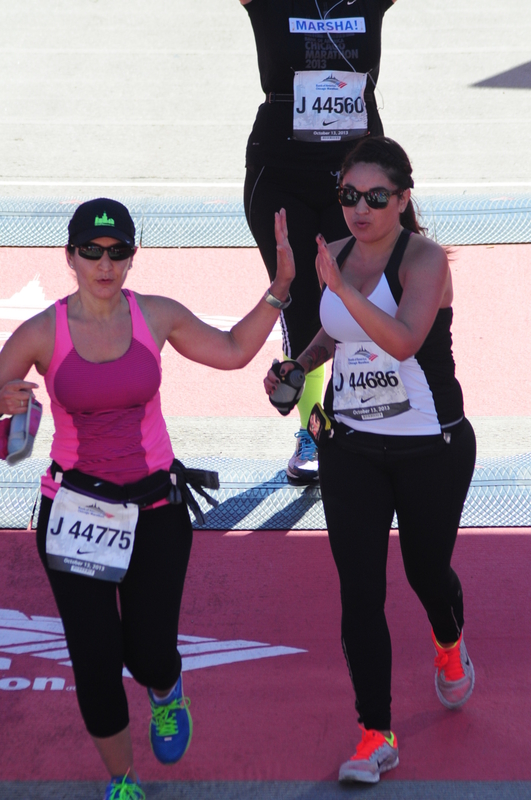 However, this photo perfectly captured how great my training partner, Beth, and I felt when we crossed the finish line of the 2013 Chicago Marathon. Anyone that has worked with me in the past (one particular high-five-loving colleague in particular) knows that I much rather prefer a laid-back fist pump to the overly happy high five. Let’s just blame this one on my having just run for 26.2. miles. This photo made a perfect gift for Beth this Christmas and I printed out a copy for myself as well. Whenever things get tough in 2014, I want to remember how hard I worked to balance all of the demands of 2013 … and how great it felt to cross that finish line. But this time it’s been a little different. If you’re wondering if I got injured again while running this marathon, I didn’t. Surprisingly I feel great. The first week after the marathon I promised myself to take it easy and not run. After running that far, my body definitely earned the right to sleep in. The week after the marathon I went on a couple of easy runs with my girls and followed them up with catching up over coffee. It was amazing. But then almost two weeks after my marathon, I faced another challenge of my tolerance for pain and endurance: I sat for almost five hours getting my new ink. You see, I had been putting off getting my newest tattoo forever because I was always training for something. New tattoos require healing that running does not afford me so the time was never right. When I signed up for Chicago, I promised myself to finally make time afterwards. I’m hoping that I’ll be able to run again in a couple of weeks … Just in time for my annual run of the Turkey Trot. I might even run the Orlando Half Marathon in December. If I do run the half, though, I will have to head home right after the marathon, then shower and head over to finish the rest of my tattoo. Ew. Running a half then having to sit still and getting poked at with needles for five hours doesn’t sound like much fun. To say that I loved the new low temps would be an understatement. I was in heaven. The temp from Thursday’s run will be the HIGH for Sunday’s marathon. And the chance of rain has dropped to only 10%! 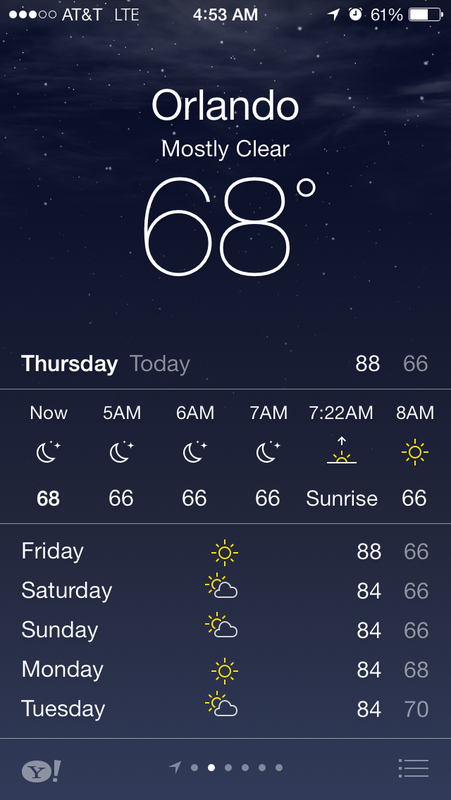 It’s going to be perfect running weather. I’m a bore so I picked gray. 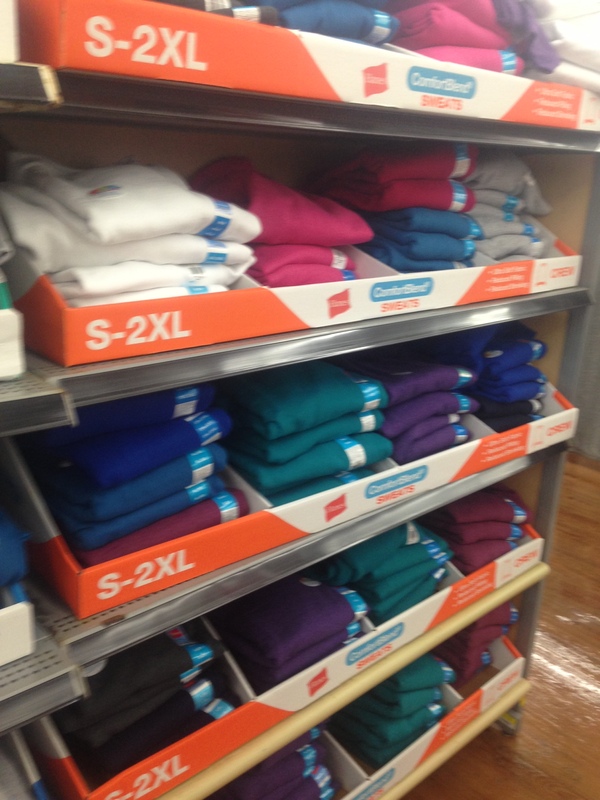 But I wasn’t thinking about others in my decision… I bet someone would’ve loved some nice purple sweats donated to them. There’s always next time. 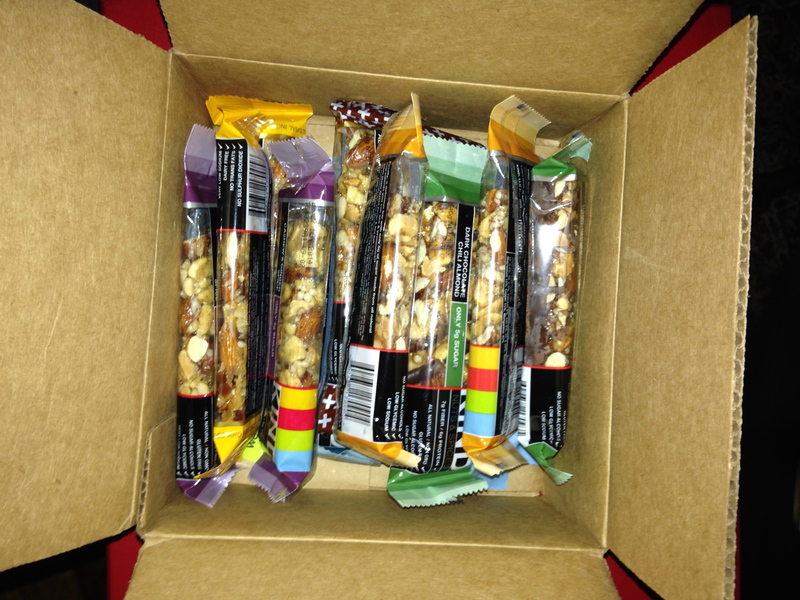 Earlier this week I received a special “care” package from the team at KIND Healthy Snacks. Ever since I started my MBA, I haven’t had time to make my homemade peanut butter protein bites, which are the perfect pre-run snack. So instead, I’ve been grabbing KIND bars at the store, which are the next best thing for me. KIND Peanut Butter Dark Chocolate + Protein has been my favorite, but I have a feeling I might find a new favorite in here. People seem to be sick all around me. 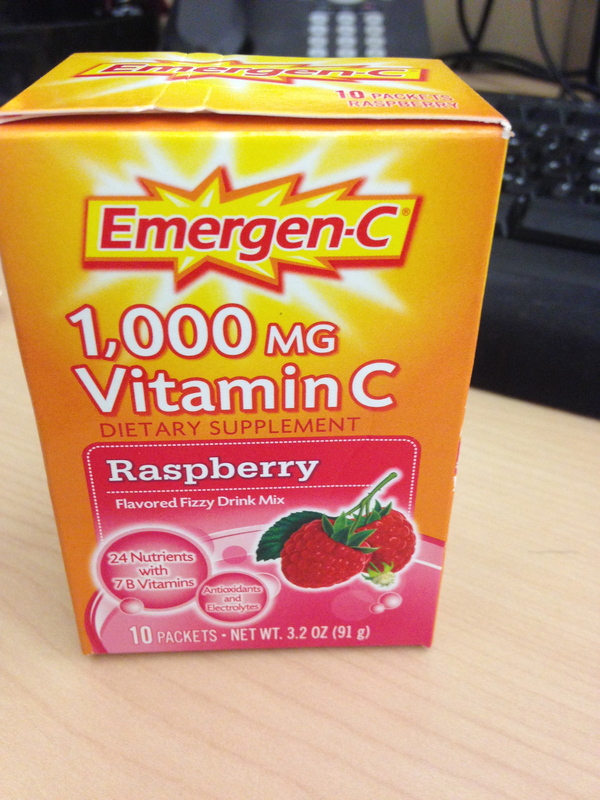 I’ve been taking this daily in hopes that I don’t contract deadly disease. 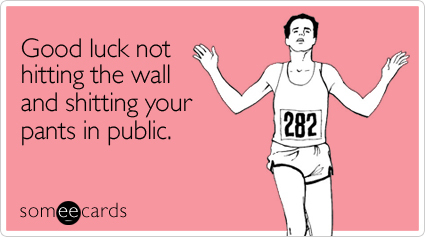 Much luck to all of you running a race this weekend! I’ll catch you on the flip side of 26.2.